He more than right, Tiger sure was a heck of a tank. In WWII it's main weakness was 1 it's speed, meaning it could be out flanked, and 2 it had a gap between the chaos and the turret, which was discovered by Allies. One shot there and it was done. Rest is a complete battleship. Edited by randy12345, 18 April 2016 - 08:02 PM. He was part of a Tank Destroyer division and he got to drive the Jagdpanther. As well as the Nashorn. He was the sniper of tank commanders and he saved a town! Great grandpa is still kicking today....I wish you could all meet him, he's really nice. One would imagine there are more than listed here. I found a list of German tank aces on Wikipedia, where number 2 was given as Martin Schroif and not Otto Carius. Both are listed here as number 2 regardless. One of my favorites is the actual highest scoring tank ace, yet less known than Carius or Wittmann, and that is Kurt Knispel. He was never awarded the Knight’s Cross, and never pursued the award, though he was recommended for it 4 times times (acccording to Wikipedia. Knispel preferred others be given credit and not himself. According to Wikipedia, "Knispel's slow promotion is attributed to several conflicts with higher Nazi authorities (for instance, he assaulted an Einsatzgruppen officer whom he saw mistreating Soviet POWs) and general lack of military bearing, sporting a goatee and hair longer than regulations. Only his impressive track-record saved him from ending up in a military prison." The following list gives the tank ace's name; number of kills; unit attached to; and the date if the person was awarded the Knight's Cross, or any higher grades such as swords, or oakleaves. Contributors; Ron Klages, David C. Clarke, Erich Brown, Steve Eckardt, John S.
4.Michael Wittman – 138 Kills (sS.S.PzAbt. 101 Liebstandarte)–Tiger I–Knight's Cross 1/14/44, Oak Leaves 1/14/44 with Swords, 6/25/44. 11.Karl Koener – 100+ Kills (sS.S.PzAbt. 503)–Tigers–Knight's Cross 4/29/44. 23.Josef William (Sepp) Brandner – 61 Kills (StuG Brigade 912)–Knight's Cross 1/17/45, Oak Leaves 4/30/45. 29.Johann Muller–50 Kills ((sPz. Abt. 502)--Tigers–Knight's Cross 10/23/44. 36.Jurgen Brandt—47 Kills (sS.S.Abt. 101)–Tigers. 42.Rudolf Roy—36 Kills (12 S.S. PanzerJager Abt. HJ)–JP IV–Knight's Cross 10/16/44. 1. Georg Bose -44 kills; Knight's Cross of the Iron Cross on 21 September 1944; (1./Sturmgeschütz-Abteilung 177). Bose is also appears in Season 1, Episode 9, of the cable tv series, Greatest Tank Battles, "The Battle of Kursk: The Northern Front." Bose also wrote, prior to his passing, a 3 volume memoir of his service with the German forces in World War II. Dragon Models, in 2007, released a 1/35th scale plastic model kit, and a 1/72nd scale fully assembled diecast model of Bose's StuG. ; and a 1/6th scale action figure of Bose in World War II uniform. 2. Bodo Spranz-76 kills; Knight's Cross on 3 October 1943 (I. / Sturmgeschütz-Brigade 237); Oak Leaves on 3 October 1943 (I. / Sturmgeschütz-Brigade 237). Dragon Models, in 2008, released a 1/35th scale plastic model kit, and a 1/72nd scale fully assembled diecast model of Bose's StuG. ; and a 1/6th scale action figure of Spranz in World War II uniform. 3. Oberleutnant Knarth, 68 kills, s. Pz. Abt. 505. 4. Oberfeldwebel Litzke, 76 kills, s. Pz. Abt. 509. 5. SS Obersturmfuhrer Kalls, ? kills, 8th s. Pz-Kp. then SS s. Pz.-KP "Das Reich" (unit which later became s.Pz. Abt. 102 (502). 6. Feldwebel Rempel, destroying, on one occasion, 18-T34s with a Tiger on it's way to be repaired; 13th Schwere Kompanie/III Abtielung, Grossdeutschland Division. 7. Oberleutnant Beyer who scored 10-T34 kills on 16th November 1943. 8. Oberfeldwebel Hermann Eckhardt; 78 Kills on the Eastern Front using Panzer IV and StuGs whilst serving with Panzer Abt. 8; Ritterkreuz on 18/3/45. Eckardt also served with 15 Panzer Div. in Afrika, so, his total is probably a few more. 9. Hans Klöckner with the Königstiger alone accounted for over 28 Soviet Tanks; SS Schwere Pz. Abt. 503. 10. Commander Hans Diers, 52? kills. On 30 April 1945, Diers moved his Tiger 2 towards the Reichstag and knocked out around 30 Soviet T-34's. 11. Oberleutnant Knarth, 68 kills, s. Pz. Abt. 505. 12. Oberfeldwebel Litzke, 76 kills, s. Pz. Abt. 509. 13. Karl Körner was a great ace-during the battle for Berlin, in ONE action, he accounted for 39 Stalin tanks alone. 19 April 1945, 3 Tigers engage over 100 T-34/85's and a company of JS II's with Hauptscharführer Harrer and 1 other Tiger. On this date Karl Körner, his 25th birthday scores his 76th kill in fighting against JS II's at night with the useage of flares; SS Schwere Pz. Abt. 503. 14. Alfons Stegmaier of 2nd SS Pz. Jager 2 with the StuG. III, 25 plus kills; German Cross winner. 15. Roland Paul of 2nd SS Pz. Jager 2 with the StuG III and later Pz. Jager IV, 45 plus kills. 16. Jakob Lobmeyer of 15th SS Pz. Jager and later his own SS Pz. Jager 561, some 50 plus kills using the Hetzer. 17. Hauptscharführer Harrer destroyed 25 Soviet tanks on 19 April 1945, when 3 Tigers, one of them being commanded by Karl Körner, who is mentioned above, engaged over 100, T-34/85's and a company of JS II's; SS Schwere Pz. Abt. 503. I have included pictures of the first 5 German tank aces on the list (left to right): 1. Kurt Knispel; 2. Martin Schroif; 3. Otto Carius; 4. Johannes (Hans) Boelter; 5. Michael Wittmann. He more than right, Tiger sure was a heck of a tank. In WWII it's main weakness was 1 it's spend, meaning it could be out flanked, and 2 it had a gap between the chaos and the turret, which was discovered by Allies. One shot there and it was done. Rest is a complete battleship. Huh....my great grandpapi is number 26 on that list. .-. Ouch... Painful way to die. Edited by je4n10, 01 December 2016 - 05:11 AM. E75 never got out of the blue prints and E100 was never finished (it was very likely to use the Maus turret). The Sherman Fury, is Literally a M4A3E8, there is no possible way a 76mm cannon is even close to penetrate 6-7 inches of armor. 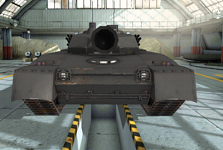 The firefly was very unlikely to even confront any of this tanks because of their limited use. The AT15 was a prototype, so nice job bringing that up.